Coat your wheels and glass with Pinnacle! I'm not a coating guy, because car detailing is my hobby and I like to do it often. With that said, I don't enjoy protecting wheels and windows (and haven't met many that do). Naturally, I gave this combo a try and figured I would learn how to apply coatings on these smaller car parts. Both went on very easily, to my surprise. For a beginner like me, I can't imagine an easier coating to apply. As far as longevity, both the windows and the wheels are still beading water like the day I applied it in February. I will eventually try the coating booster on these, but currently I have no reason to as these seem to be lasting just fine. ProsEase of application. Longevity so far. Water beading. These are easy on and super easy off. Just use a polish on both wheels and glass, then a wipe down with an IPA type solution and spray the coating on a foam applicator and wipe on, let it flash and wipe off, done! 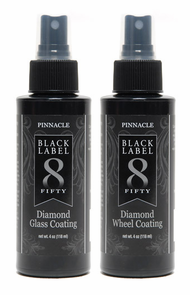 The glass coating gives me 6 months of protection and the wheel coating lasts about 9 months. You will save money on wheel cleaner. After applying just use soap and water for wheel cleanup, no need for expensive wheel cleaners.